Born in Sweden, raised in Peru & Colombia. Anna notes that where her classmates in Bogota “were constantly talking about the future (or football, at which I excelled) I was mostly dreaming about the past. 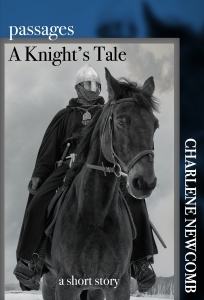 I had no desire to become a business woman – I wanted to be a medieval knight.” Obviously, Anna cannot be a medieval knight, but man, oh man, can she write brilliantly about them! Days of Sun & Glory is Book II in Ms. Belfrage’s The King’s Greatest Enemy series and pulls us back into the life of Sir Adam and his wife Kit. Concerned that you haven’t read Book I? Don’t be. This book works fine as a stand-alone. And I say that as someone who is barely familiar with this particular time period. Usually these are two separate questions, but I have combined them here. I was torn between laughter and groans watching the jealous reactions of both Kit and Adam, the two main characters. In this sequel to In the Shadow of the Storm, they have been married more than two years and have been to hell and back for each other. Their devotion to and love for each other is so vivid and well drawn. The bits of jealousy had me getting impatient with them both after a while. “You’re shaming me,” Prince Edward said. “Shaming you?” The king looked at Adam, then at his son. “Sir Adam is my liegeman. He has pledged himself to me, and I, in return, have pledged to protect him – isn’t that what liege lords do?” The prince turned wide eyes on his father. …Kit would gladly have nailed his intestines to a tree and have him walk around it until he’d disembowelled himself, she had to admit the man exuded some sort of magnetic allure, his sharp features enhanced by the neatly trimmed beard that clung to his cheeks and chin, his eyes glittering under dark, straight brows. Oh, Anna, you have such a way with words! Kenilworth was like a dog with fleas, always itching, always restless. …the autumn wind painted roses on her cheeks. Book II of Ms. Belfrage’s series The King’s Greatest Enemy, is well researched with plenty of historical details that will transport the reader to the 14th century. Ms. Belfrage makes her characters come to life, and if you aren’t cringing with fear every time Hugh Despenser comes on scene, why not?! Evil radiates from that man. This is a turbulent era in England’s history and even readers unfamiliar with this particular time period will be drawn into the fictional life of Kit and Adam de Guirande drawn against the reign of Edward II. Kit and Adam find their lives governed and their hands tied by the politics and intrigue surrounding them. Spies are everywhere. Kit serves Edward II’s queen, Isabella, who, untrusted and unloved, plots against her husband. Adam’s former allegiance to Edward’s enemy Roger Mortimer, now exiled in France, makes him a traitor in Edward’s eyes. Adam may have sworn his allegiance to Edward’s son, but Despenser and the king seek any excuse to throw him into the dungeon, or worse, execute him. I was genuinely frightened for both the fiery Kit and the loyal Adam, which shows how much I cared for them. When they become embroiled in Mortimer’s plot to raise money and an army to fight Edward, the stakes become deadlier. Queen Isabella and Prince Edward are sent to France to negotiate a peace, and Adam and Kit with them. The tale becomes heart wrenching as their family is torn apart and the young prince becomes a pawn in his mother’s hands. Will Adam and Kit stand by the prince, the queen, and Mortimer? The story of King Edward II and his favorite, Hugh Despenser, is one that in and of itself sounds more fiction than fact. But it is true, an incredible twisted history that Ms. Belfrage breathes life into with the help of her fictional characters. Disclosure: I received an advanced copy of the novel in exchange for an honest review.